Boca Juniors decided to postpone their 108th birthday celebrations last night in the aftermath of the deadly flooding that has struck the Buenos Aires area but on the pitch they were able to enjoy a hard fought 1 – 0 win over Barcelona of Ecuador and almost make certain of qualification for the next round of this year’s Copa Libertadores. Nicolas Blandi’s scrappy goal was enough to give them victory. Meanwhile, in Brazil, a Ronaldinho inspired, Atletico Miniero thrashed Arsenal for the second time in the tournament and by the same scoreline 5 – 2. Despite already being through Miniero eased to victory and top the group with maximum points. Arsenal have a game left against The Strongest and will be hoping to pip Sao Paulo to the second spot. REPORTS AND GOALS HERE…. Juan Roman Riquelme said after the game that Boca “will have to improve a lot” but at least with this win they have given themselves that chance. As I write, Nacional are on the verge of defeating Toluca which will mean that Boca have qualified for the next round but will need to beat Toluca and hope Nacional drop points if they are to top the group. Last night’s game was not made easy and Barcelona will feel agrieved by a blatent penalty denied in the closing stages. 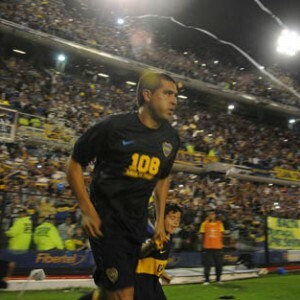 Boca will not care in the slightest and will have been pleased to see Riquelme take his place back in the starting lineup. The winning goal came after just 8 minutes when Nicolas Blandi was able to bundle home a knock down. It wasn’t pretty but it got the job done and Boca and Bianchi can now begin preparations to win this trophy once again. Ronaldinho and his team mates once again proved too much for Arsenal as they were thrashed 5 – 2 for the second time. Miniero showed that they are very much one of the teams to beat in this year’s competition, winning their fifth successive game despite already knowing they would top the group. Arsenal are now dependant on other results to claim the second spot. Goals from Diego Tardelli, two from Ronaldinho (one a debateable penalty and the other a wonderful strike), Luan and Alecsandro were enough to see off Arsenal. Arsenal once again managed two consolation goals through Diego Braghieri and Dario Benedetto but the main talking point came after full time when 4 Arsenal players were detained following a clash with Brazilian police. More to come on this….